Insider Build 15025 adds important features to Windows 10's Ease of Access capabilities—and a Night Light. Microsoft just rolled out the latest Windows Insider build in the run-up to this spring's Windows 10 Creators Update. This time around the new preview version of Windows includes some important updates for the visually impaired, and improvements for Windows addicts looking for some visual relief at night. The improvements for blind users will help in multiple ways. First up is braille support in Narrator. Blind users can employ a braille display in order to read the screen, and this latest feature makes that possible in the Insider preview. The feature is currently in beta and includes the ability to choose various languages and braille tables. The new braille options are under Settings > Ease of Access > Narrator. Build 15025’s new braille settings. Microsoft also added a mono audio option in the Ease of Access settings. That way all sound from the PC will be funneled through one earphone. This allows users to hear all sounds from the PC in one ear while listening to people around them with the other. On top of the two important improvements for blind users, Microsoft also improved the Night Light feature. The display color temperature slider now works across the entire range, allowing greater customization of the display during night time computing sessions. Finally, Microsoft also improved the Feedback Hub to reduce feedback duplication with a new feature called Collections. 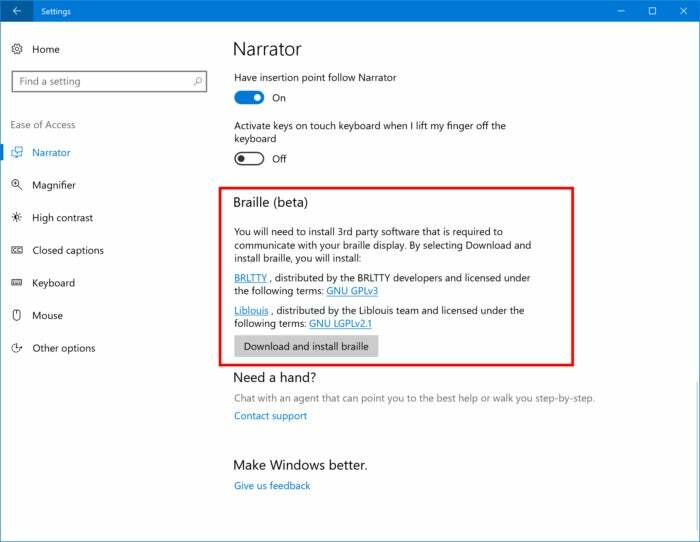 The impact on you at home: Build 15025 may be an omen of things to come for the Insider program. The latest rumors suggest Microsoft wanted to wrap up new features for the Creators Update by late January, as it prepares for an expected roll out in late March or April. If that’s the case, we probably won’t see that many exciting new features for general users. Instead, bug fixes and the like should be the main focus of Insider builds fairly soon.